Sometimes the only time to fit in exercise is during the weekend. 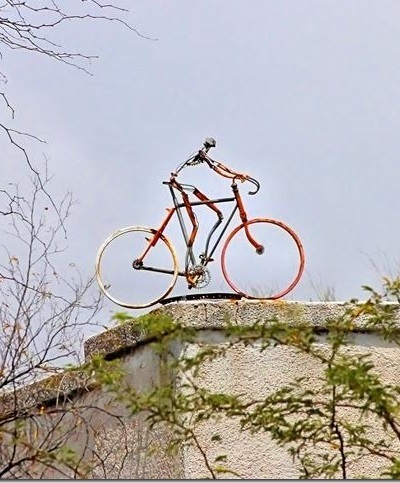 But this skinny guy bicycles 24/7 on the top of a house in the Dunbar/Springs neighborhood. Hey! Eat a sandwich! And what happened to the spokes on his bike, hmmm? 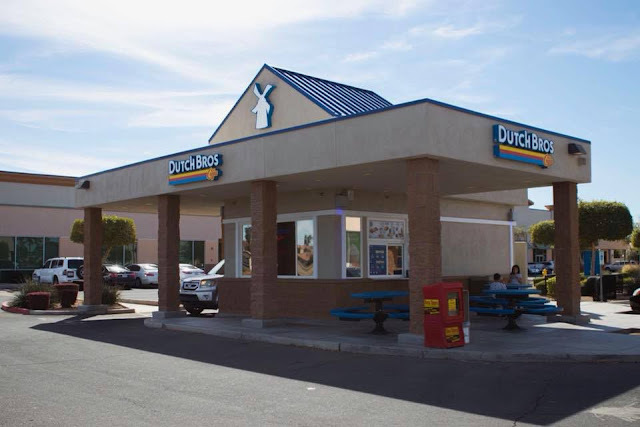 When I think of Dutch products I think of chocolate but apparently Dutch Brothers Coffee is well known in the northwest and now it is coming to Tucson. A building similar to this drive through in Chandler will be built at the corner of Wilmot and Broadway (near the now-defunct Mimi's Cafe). Here's the full story! Coffee drinkers will cheer this new addition to the coffee purveyors in town. This is a stage coach on display in Tucson's fantasy western community, Trail Dust Town. Imagine traveling across the country in such a rig ~ or even just across town! Hot, dusty, uncomfortable, slow... The folks who settled the West were definitely made of tough stuff. And they traveled light! 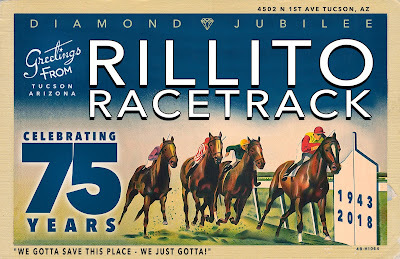 Happily, Trail Dust Town is still fun and still displays amazing memorabilia about how the West was developed. Last week I shared a recipe from Tucson's The Coronet restaurant. Here I am sharing the pink sunset view from the patio. The Coronet is at the corner of 9th Street and 4th Avenue so you see and hear the trolley and the train go by during the evening. Wonderful food and wonderful service! One of my favorite places to dine! Here is the set for "Low Down Dirty Blues" - Big Mama's club in South Chicago. This is the current production of Arizona Theatre Company at the great Temple of Music and Art downtown. The show was wonderful! I can guarantee you will enjoy this musical event! The show runs through March 31 in Tucson and then travels to Phoenix for performances from April 5 -21. Stellar cast with a lot of energy singing and playing some of the best blues classics. 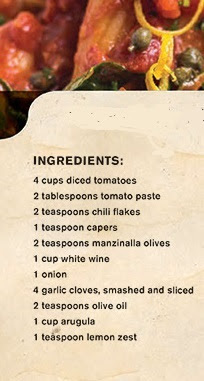 I love featuring recipes from local Tucson restaurants. Tucson has so many great food choices - why would you ever go to a chain restaurant?? 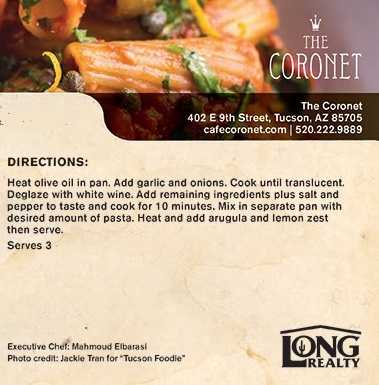 Here is the recipe for RIGATONI ARRIBIATA from one of my favorite downtown restaurants - The Coronet. It is a small place with a great European flair. Bon appetit! 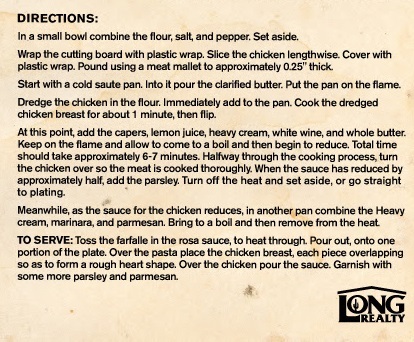 Recipe thanks to Susan Dodson. Anglophiles and coffee lovers can rejoice! The mighty Bristol Coffee Bus is brewing again! I was delighted to see it parked on the north side of Golf Links Road near Wilmot in the parking lot of the Desert Taekwondo studio (6221 E Golf Links Rd). What everyone loves is the seating "up top" ~ a nice place to relax with a cup o' Joe. For more info about this bus, check my posting from December 30, 2009. NOW: This bus/coffee shop seems to have vanished from the Tucson landscape. 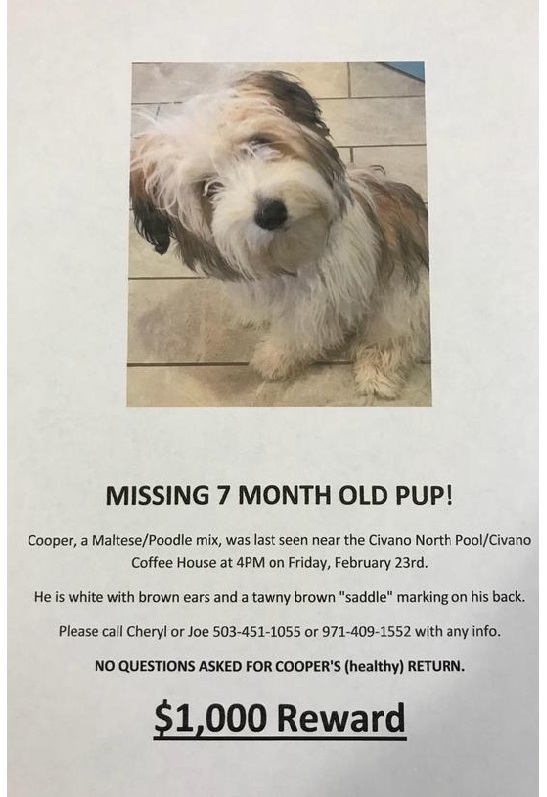 If you can supply any news of its whereabouts, please post a comment! Thanks! I am not a dinosaur expert so I looked up some dino images and I THINK this truck's ancient hood ornament is an Ankylosaur. Here's what I looked at to identify it. If you know more, please share! It's time again for Tuesday Tucson Trivia! 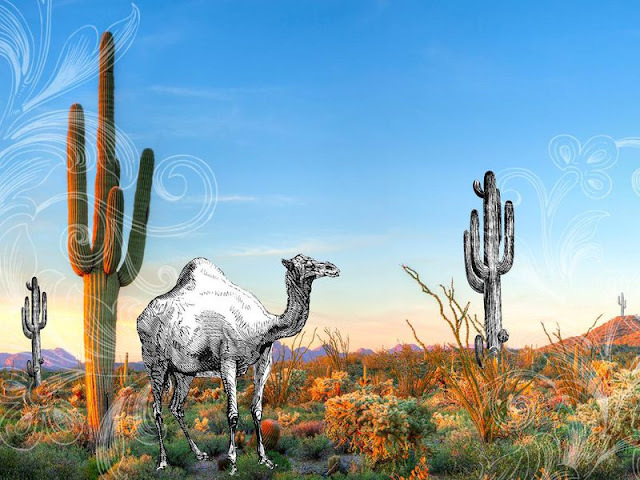 There is a law on the books that states "Hunting Camels is Prohibited." Does that pique your interest to learn more about this weird law? Click here for a story from the Smithsonian! 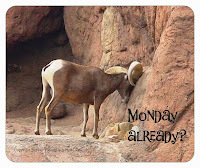 Yes, it is indeed Monday! Where did the weekend go? Welcome to another week of unpredictible weather in Tucson - some cold days, some rain, and some sun. As the saying goes, March comes in like a lion and goes out like a lamb. Let's move the thermometer up from the 40's, please! Yay! It's the weekend! 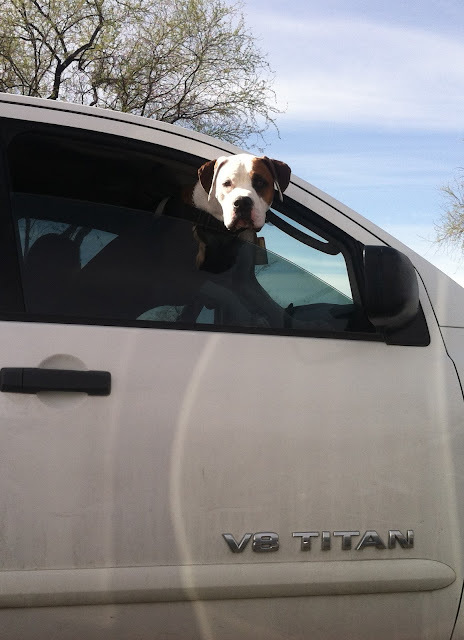 Time to go for a ride and enjoy the fresh air. And as the popular bumper sticker says, "More Wag, Less Bark!" Enjoy! Did you know that March is National Caffeine Awareness Month? Yep, it's true! Need a little picker upper? Here's some advice from the coffee shop experts! Wow - it's hard to think of a caption that adds anything to this sign! I guess you can really just dash in for a touch up! My, my. I just love that we have Little Free Libraries all over Tucson! Here is a particularly fun one that site follower David Aber forwarded to me. "NW corner of W. 2nd St. & N. 10th Ave. in the Dunbar/Spring Neighborhood. 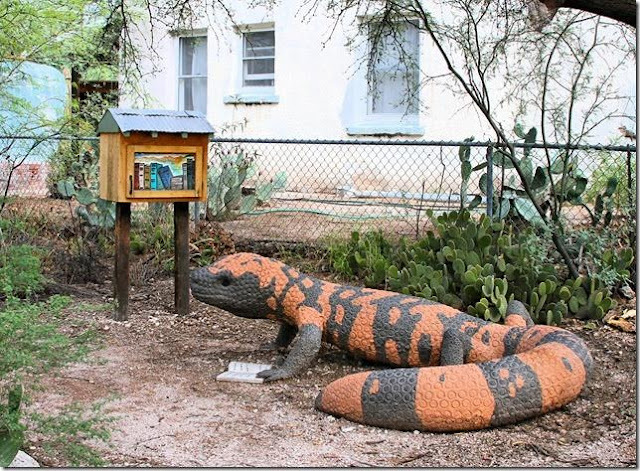 The gila monster, created by Hirotsune Tashima & Jason Butler, is reading a poem entitled, "The End of the Chapter" by Paul Laurence Dunbar. Poem note: This location has appeared in teh Daily Star's website (tucson.com) on 3/25/13 and 7/03/16 (not my photos). 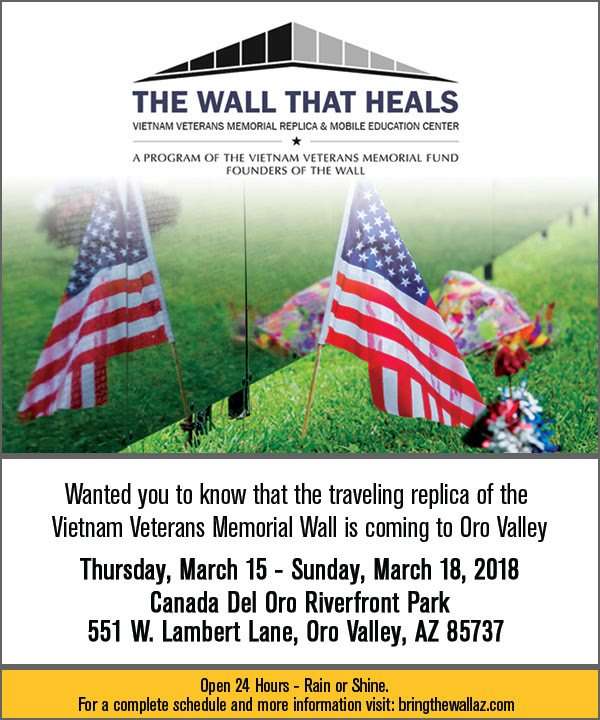 Here's the link: Tucson Oddity"
They say that laughter is the best medicine and the absolute expert of this form of therapy is the amazing talented cast that you will enjoy at The Gaslight Theatre. The current show is "The Lone Stranger" and it runs through March 25. Be sure and stay for the "after show" - the Olio - which is a wonderful show unto itself! 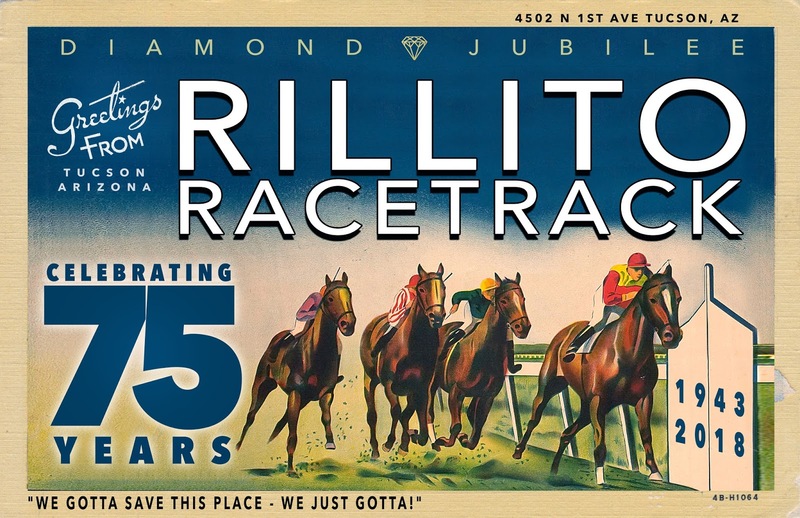 This is a Tucson Treasure! It's time again for another "Where is this?" contest! First person who can identify where this abandoned Mining Cart is displayed wins a fabulous TDP t-shirt! Here is a clue: This mining cart is on a main north/south thoroughfare and is on permanent display in front of a restaurant. Any guesses?? 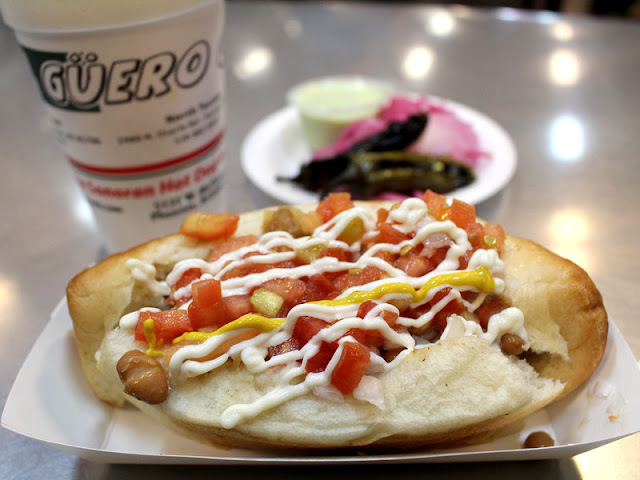 It's no surprise that we have many great Mexican restaurants in Tucson - some of them have been been open for nearly 100 years. Here is a feature piece on National Public Radio that salutes our many Sonoran-influenced culinary treats and products. It also mentions a few "must try" restaurants that are not mentioned in some of the traditional restaurant guides. Click here to read all about it. Yum! Surely one of the most beautiful buildings in downtown Tucson is St Augustine Cathedral on Stone Avenue. Over the front door carved in stone are various desert plants and inside the santuary the saguaro cactus blossom is featured on the main altar, pulpit, lectern and baptismal font. 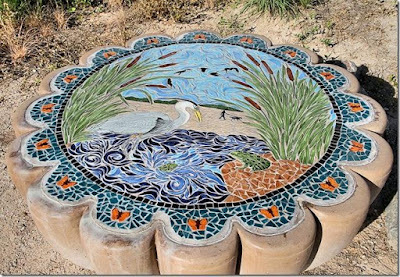 On the north end of the property is a colorful canopy/gazebo/stage which is formed of brilliantly colored metal flowers. I'll post that tomorrow so stay tuned! NOW: Construction! The north side of the property is being developed as a low-income property for seniors. The colorful floral bandshell will be moved but I can't find a confirmation of its new location. A talented photographer and a site follower, David Aber, sent me this photo of one of a set of "tuffets" seen around town. I had never seen them and, in fact, have not (yet!) visited the park they adorn. Do you know where this series of concrete and tile work beauties can be found? 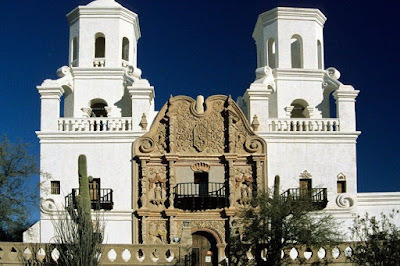 The Mission St Xavier del Bac (aka "White Dove of the Desert") is the oldest intact European structure in Arizona. In 1790 when the Mission was founded, the land was still part of Spain. This structure is considered one of the finest examples of Spanish Colonial architecture in the United States. Welcome to a new week and to the first Monday in March! Spring is not far away now. This charming flower-decoratead gate caught my eye as I was on a walk in my neighborhood. So pretty and so welcoming. Happy Monday! 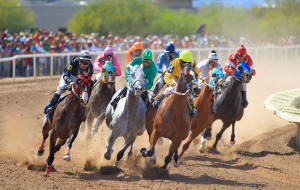 This Tucson race track is where Quarter Horse racing began! The winter schedule runs from Feb 10 to March 18 so you have three more weekends to check it out until next year. For the full weekend program - including the famous Budweiser Clydesdale horses - click here. Tucson has so many great restaurants! 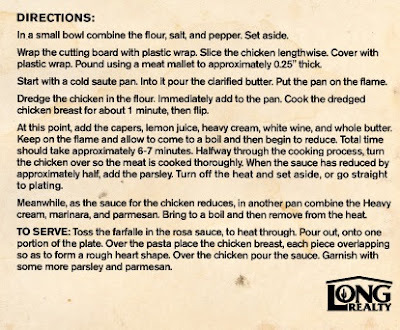 Here is a yummy recipe for Chicken Piccata created by the chef at Vero Amore. Yum! 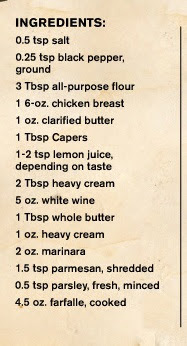 Recipe courtesy of Susan Dodson. This winter we have had several cold spells with nighttime temps in the 30's but so far this year we have not had any snow. I remember one year shortly after I moved to Tucson that it snowed on Easter Sunday! We're not out of the woods yet!